24th May- As route cards were handed out it was noted with misgiving that the destination had been changed from Calais to Cassel. The route lay through Lille, Armentieres, Bailleul and Caestre. At Bailleul each driver was given a new destination—Hazebrouck. The Battalion was in the rear of the brigade column and was therefore the easiest of the three to detach. After more long halts the column arrived at the outskirts of the town. Nearing Hazebrouck it was noticed that every village had its homemade roadblocks generally constructed of farm carts. At about 1000 hrs. the Battalion entered the town and started cooking breakfast in the main street. in Hazebrouck until the day before. Now the Battalion was to help guard the rear and flank of the B.E.F. The G.H.Q. building had been a large school in the Northwest of the town. Major Heyworth had great difficulty in discovering which and how many miscellaneous troops were coming under his command. He managed to extract an approximate list. Artillery (in support) consisted of four 25-pounders and four anti-tank 2-pounders. (In addition, Serjeant Trussell’s platoon of the brigade anti-tank company was still under command.) G.H.Q. also left some two hundred men consisting of orderlies, runners, signallers, drivers and a big contingent of leave men from the York and Lancaster Regiment. There was also a platoon of the 4th Cheshire Regiment with four Vickers guns. As an after­thought, G.H.Q. bequeathed a dozen Boys anti-tank rifles and a few Bren guns with a good supply of ammunition. Later it was discovered that there were a few anti-aircraft guns in and around the town. To complete the assortment of supporting arms, there were some old French and Belgian tanks; but they were in such a bad state of repair that they could only be used as roadblocks. The Battalion was not allotted any wire or anti-tank mines. 25th May.--During the day enemy aircraft flew over the town strafing and bombing, but causing little damage. The day was spent in completing the take-over from G.H.Q. and improving company positions. The relief was completed by 1400 hrs. The night was quiet. D Com­pany reported that the company front could not be adequately held and No. 9 Platoon of A Company was put under the command of D Company. 26th May.--Very little of note was reported during Sunday, the 26th May. In the afternoon Brigadier Somerset visited Battalion head­quarters. move. During the day a few enemy tanks were seen in the distance, but well out of range. There was slight enemy artillery activity in the afternoon, no material damage being caused. A large number of enemy reconnaissance aircraft flew over the town. In the early evening a report was issued that six enemy tanks had been seen approaching towards Hondeghem, a mile or so to the north. Two companies and a section of carriers were ordered there; the carriers went, but the move of the companies was postponed. 27th May.--In the morning of the 27th the battle began in earnest. The weather had broken at last; it was cloudy, with a heavy shower in the afternoon. All day there was firing, and enemy movement was visible in some part of the Battalion’s area. At 1200 hrs the enemy started a general attack on C and D Companies. The town was bombarded by infantry, guns and heavy mortars, while flights of enemy aircraft flew over bomb­ing and strafing. The enemy also found the range of Battalion headquarters, which suffered some damage. A Company near by had heavy casualties. D Company was also hard pressed. B Company was ordered to try to support D Company by overhead fire which it was hoped would prevent a threatened penetration of the town to the west of the railway station. At 2030hrs. the enemy broke right through D Company’s position with infantry and tanks, and pushed in towards the centre of the town and Battalion headquarters, at the same time working in to the rear and cutting that company off entirely from the rest of the Battalion. Others of the enemy worked to the right flank of A Company and established a machine-gun post covering the road running behind it. It is difficult to piece together all aspects of the rifle companies’ fighting at this time, but the general picture is of a series of platoon battles; while the Germans, using tanks and infantry, gradually infiltrated through the gaps between company and company and between platoon and platoon. Nearly all platoons were heavily engaged, particularly those of C and D Companies; for them the battle had begun in earnest at 0900 hrs and had continued all day. That the enemy was able to make penetrations, albeit at heavy cost in men and tanks, was due to the inevitably wide frontages held by companies. Major Heyworth’s plan, was to have all-round defence of the town. 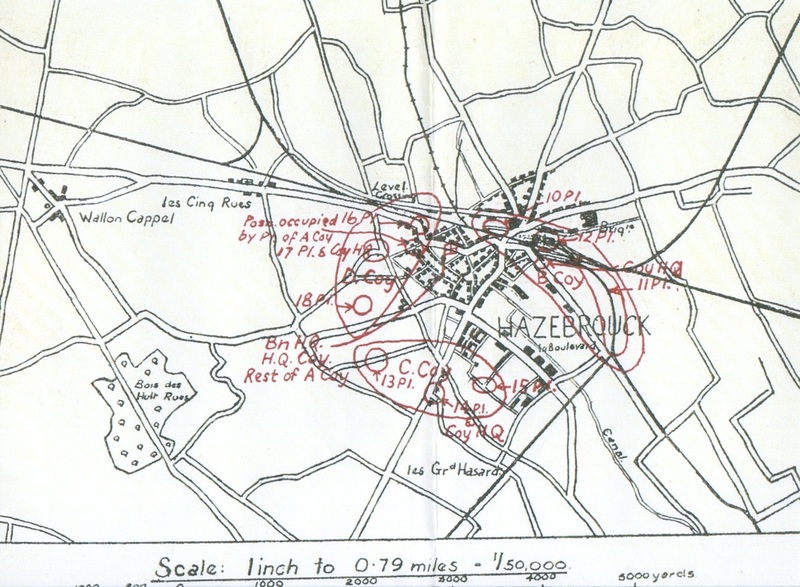 To ask a single battalion to defend effectively a town of Hazebrouck’s size was at the very least asking a great deal. Even so, Major Heyworth succeeded not only in providing all-round defence, without depth it is true, but in keeping one company in reserve. This company, A, was used as planned when it went to the support of C where the pressure was strongest. head­quarters and H.Q. Company were surrounded; and that the Battalion as a fighting force had ceased to exist. In a final attempt to re-establish touch with the troops which had been nearest to headquarters, patrols were sent out soon after dark, one to B Echelon and the other to B Company. Second Lieutenant Preston’s patrol to B Echelon very soon bumped into the enemy in the square, where the French had surrendered earlier in the evening, and after a sharp skirmish he ordered his men to return while he tried to get through alone. He was never seen again and was afterwards reported killed. In contrast to the day, the night was almost eerie in its quiet­ness. All except sentries slept a weary sleep. Stand-to was ordered earlier than usual, as no risks were to be taken. Early in the morning parties went across to the G.H.Q. building foraging for ammunition and food. Some preserved stores were found, but not much ammunition. A hot meal was cooked and distributed soon afterwards. more accurate fire from the enemy six-barrelled nebelwerfers. and they were unceremoniously consigned to the cellars. It was agreed between Majors Heyworth and Viney that as the remnants of the Battalion were obviously not now holding up the advance and the rifle companies had been overrun, added to which brigade had ordered a move out the day before, all who were left should march out and make for the coast that night, provided that resistance could be maintained until then. chapel wing was now useless. The enemy had the exact range. There were many wounded by now and Major Heyworth decided to go across to the G.H.Q. build­ing to see if it was worth evacuating there. He never returned. It was now 1800hrs and six tanks were bombarding the main building at short range. There was a great roar as it collapsed altogether. The tanks advanced towards it still firing hard. Then a section of infantry came noisily down the street. He ducked down at his window, but he had been seen. Just as one of the Germans threw a grenade into the house he climbed through the window and surrendered his party. The defence of Hazebrouck was over. Of those who fought in the Hazebrouck action, ten officers and about two hundred other ranks, mostly from rifle com­panies, succeeded in getting back to England. The gallant struggle against overwhelming odds which the rifle companies fought on the 27th and Battalion headquarters and H.Q. Com­pany continued until the evening of the 28th will remain for ever a noble landmark in the history of the Battalion and the Regi­ment. They received a rare compliment from the enemy them­selves.